You need extra nurture and love after birthing a baby. Emotional and practical support will help you bond with and nurture your new baby during the postnatal period. You can book me for as many postnatal support sessions as you like. I can help you with breastfeeding, postnatal massage and practical chores. The fourth trimester, the three months after the birth is a key time where a mother needs to bond with her new baby, establish successful breastfeeding, strengthen herself and adjust to her changing life. In other cultures, new mothers are encouraged to stay in bed, resting and relaxing, concentrating on their new baby. They are not expected to do any chores or cooking during this time. This is an important time for your partner too, to adjust to their new role and to bond with their new baby. It can be tough for partners to carry a load that they are not used to carrying. It makes sense to get as much support and help as possible from an experienced house-keeper, who is also an expert in breastfeeding, baby-wearing and likes to nurture new mothers! The early postnatal days are precious and cannot be reclaimed later on. Each postnatal session is between two and three hours and costs just £65 plus 45p per mile travel expenses. I have good counselling and active listening skills. This enables you to explore your pregnancy, birth and postpartum story. Having a good listening ear can really help you to find your feet and become more confident in your mothering. Your baby changes rapidly in the days; weeks and months after birth and I can help you keep up with this. I can also come with you to baby & toddler groups; helping you to grow in social confidence in these situations. I am a great believer in the magic of breastfeeding. Not only is it the perfect food for babies, but also gives immeasurable comfort and solace. It is also a fantastic way to help heal a difficult birth for the mama and to establish a beautiful bond. My specialty is breastfeeding, as I am also a Breastfeeding Counsellor with La Leche League and run a support group twice a month in Monmouth. You are welcome to come to the group and access free breastfeeding support – just ask me for details. I would love to run you and your baby a beautiful candle-lit bath. This is one of my specialities! Many mothers find that their baby breastfeeds better in the bath. I can then dry and snuggle your babe in a warm towel so that you can stretch out and add some bubbles or healing herbs. 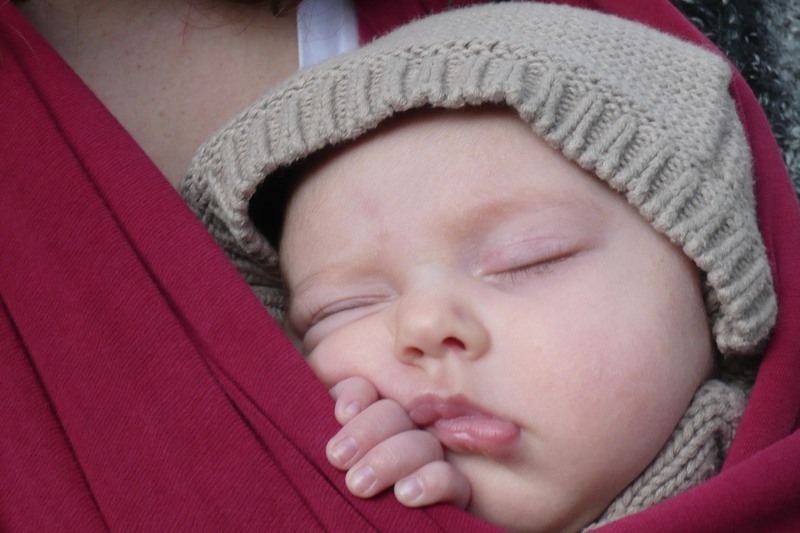 Your baby will be warm and dry, ready to return to your arms once you are out. Young babies are happiest when life outside in the world feels just like life back inside their mother's womb. For this reason we call the first three months after birth the 'fourth trimester'. We can replicate the womb world by holding a baby skin-to-skin or wearing her/him in a wrap or sling. Studies show that carried babies cry less and are much happier than babies who spend lots of time in car seats or prams. Not only that, but wearing your baby will leave your hands free so that you can get on with other jobs whilst parenting your babe. I can show you and your partner how to use a variety of wraps, slings and carriers so that you feel confident baby-wearing. Happy baby, happy parent! On a practical note, I am an expert at whipping round the house with the vacuum and quickly cleaning bathrooms. I have an eagle eye for flowers and plants that need topping up with water! I find homes for toys and fold laundry. I am happy to hang out washing, nip down the shops or even do yucky jobs, like emptying cat litter trays. I am a dab hand at changing sheets to keep your bed linen fresh, spotting overflowing bins, and making sure that your living space is kept clean and attractive. It can get you down when your house gets chaotic and dirty and with a bit of postnatal doula magic, I can quickly restore order and help you stay sane! 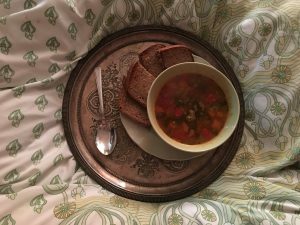 I also make wonderful soups and many clients ask me for my recipes. I am happy to make them at home and bring them to you or cook in your home. The arrival of a new baby can be stressful for siblings. I will merrily play and read stories to your toddlers and older children. I am also comfortable taking little ones to playgroup or nursery too. Once breastfeeding is established, I am happy to do a short babysitting session of up to 2 hours. I would wear your baby/ies in a sling during this time or simply cuddle him/her. What would you do with a couple of hours of ‘me’ time? Go swimming, get your hair done or have lunch with your partner? These ceremonies have their roots in South America ‘Closing the Bones’ rituals. Many believe that we would have had our own British postnatal traditions, which have been lost over time. I create my own versions, using my training in Celtic earth-based spirituality to hold this space for mothers. My ceremonies are deeply intuitive and bespoke. 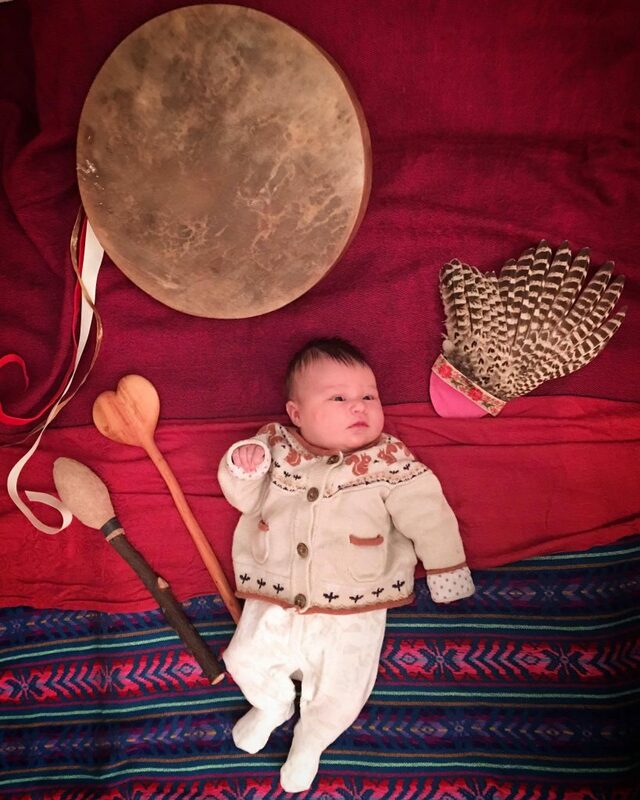 I incorporate drumming, the use of oracle cards and smudging, as well as the traditional elements learnt from our generous teachers in Equador and Mexico of abdominal massage, gentle rocking in a rebozo scarf and wrapping you ceremonially. 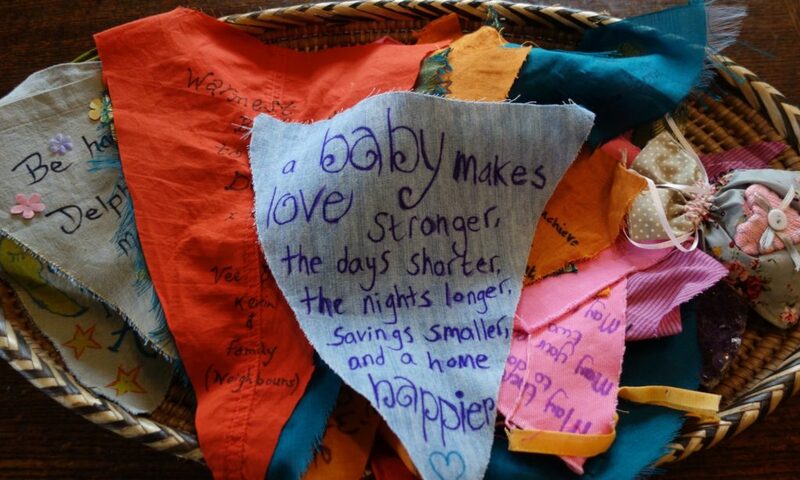 Mothers say that is a nurturing, pampering and powerful experience, enabling them to honour the work their body has done in growing and birthing a baby. It also assists healing on both an emotional and physical level. Energetically it can be done any time after birth, even if many years have elapsed. £65 plus 45p per mile travel expenses. I am an experienced celebrant and am used to working in a humanist and earth-based spirituality basis. Many people don’t feel comfortable with a Christian baptism/christening for their baby. More and more people are realising that there are beautiful alternatives. I create your Baby Blessing/Naming according to your wishes. We can include readings, poetry and music. £180 plus 45p per mile travel expenses. 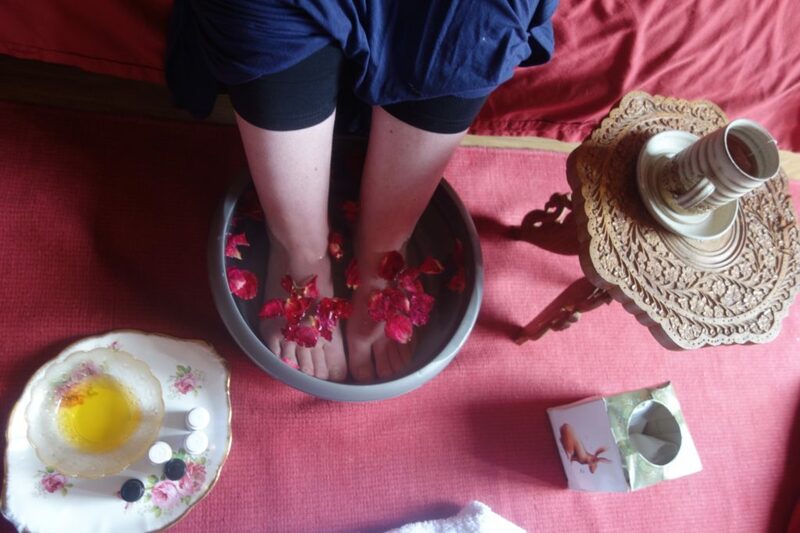 Doula package clients recieve a 30% discount, making it just £126. I will willingly honour your placenta, however you wish to do this. I can take photos or take prints from it, if you like. If you want it encapsulated then I recommend you book a specialist to do this for you. However, I am comfortable creating a simple tincture for you, making smoothies or assisting you to encapsulate your own placenta. 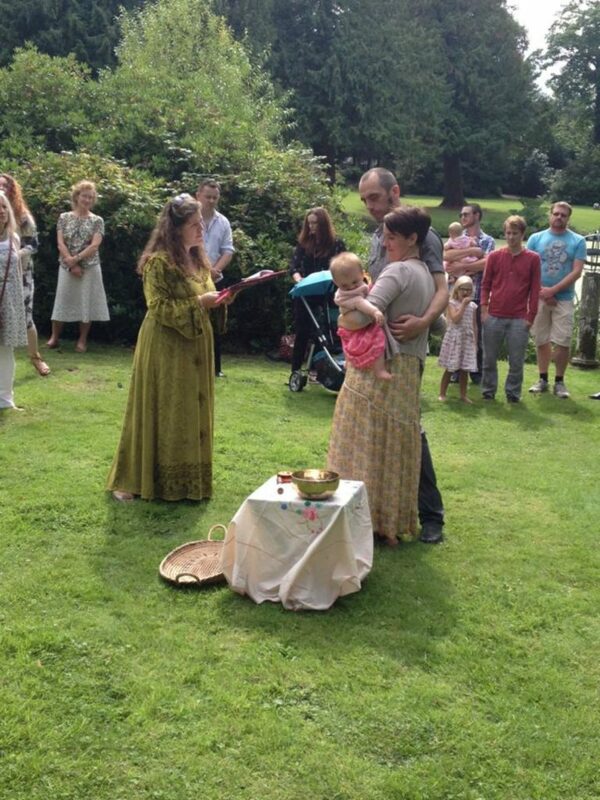 I can also create a ceremony for you where we bury your baby’s placenta in your garden or a special place.